Lowland whiskies tend to be overlooked by many whisky drinkers. That's a shame! Being a rather light, soft and floral Single Malt, Glenkinchie 12 has a surprising complexity. The nose is mildly grainy and fruity with honey, nuts and caramel. It's a busy nose that needs a bit of time to open up. 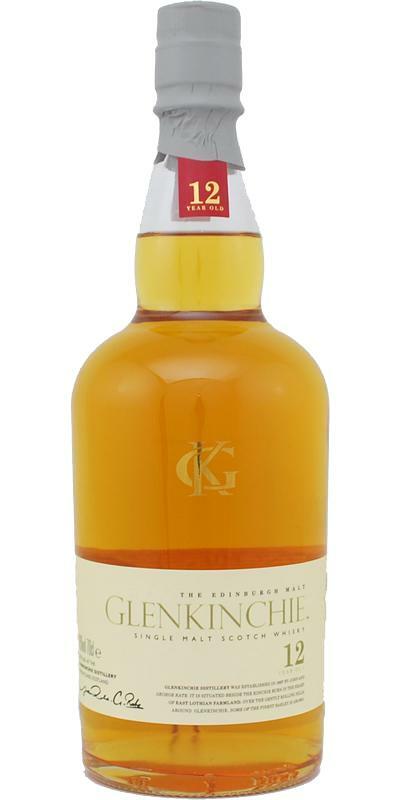 On the palate, the dram arrives full-bodied with ripe fruits, pepper and a malty spiciness. It turns slightly dry and there is an occasional spiritiness coming through. The finish is fresh and aromatic but rather short. An easily accessible malt with a remarkable character! Pleasant, if not overly complex, dram. Suitable for me as an everyday dram. Good that I have gotten the blindsample, unbiased, you can approach honestly to such a bottling. Green apple, honey, lemon, caramel and slightly flowery. Instantly green apple, and honey, light tingling and mild spiciness from the oak. The finish looks fresh, as if you had just finished sucker a ice candy. Apples are back. Pleasant entry-level lowland whisky. Light summer dram. Very nice nose; I find Chardonnay, fresh and sweet grapes, apple ... not the case in the mouth with a frank attack and a taste not really round. Too disappointed with this disagreement, the nose still prevents me from noting nearly 70. Despite a few uncharacteristic rough, grainy Edges for a Lowland Malt, the Glenkinchie 12 offers a solid Malt Whisky Experience at a solid Price.